The Sixth General Council (also known as the Third Council of Constantinople) was held in 680-681, in part to resolve a theological controversy concerning the relationship between Christ's humanity and his divinity. 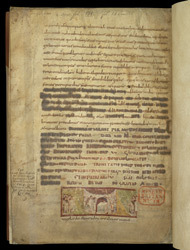 Although written in Germany, this manuscript was at Bath Cathedral by the 10th century. Pasted in at the lower margin is a cutting, probably from a Gospel Lectionary, with part of Luke 1:11 ('an angel of the Lord standing on the right side of the altar of incense'): it shows Zacharias censing the altar before the temple, with the angel and onlookers.